Pixar’s RenderMan is responsible for rendering 3D animation and visual effects in the animation studio’s films as well as many other films from various studios. If you just look at this year, RenderMan was utilized on such films as Iron Man 3, Man of Steel, in addition to Pixar’s own Monsters University. At the annual Siggraph Conference, a show that spotlights computer graphics, Pixar runs a booth for RenderMan. Crowds descend upon the booth to learn more about RenderMan and have the chance to earn some freebies. The most popular item each year is a small wind-up teapot which always has collectors clamoring for one. After the break, check out a video that gives you a close look at this year’s design and provides an origin story for where the idea for the teapots came from! Pixar’s Dylan Sisson, who designed the adorable walking teapot, took part in a video interview talking about the genesis of the teapots. 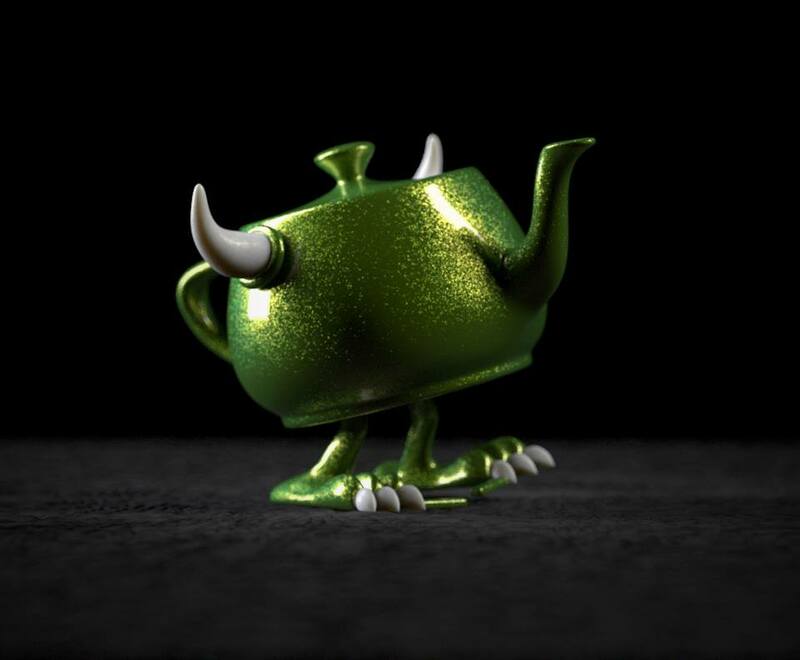 He also displays the newest teapot, clearly inspired by Monsters University (the variant teapot is seen above), which was handed out to attendees over the course of the 3-day show last week. The line for the teapots has been known to dwarf the Siggraph showroom floor, and this year was no different.